AUSTIN, Texas – Texas Volleyball will add All-American Ebony Nwanebu (WON-uh-boo) to the 2015 team, the program announced on Wednesday. 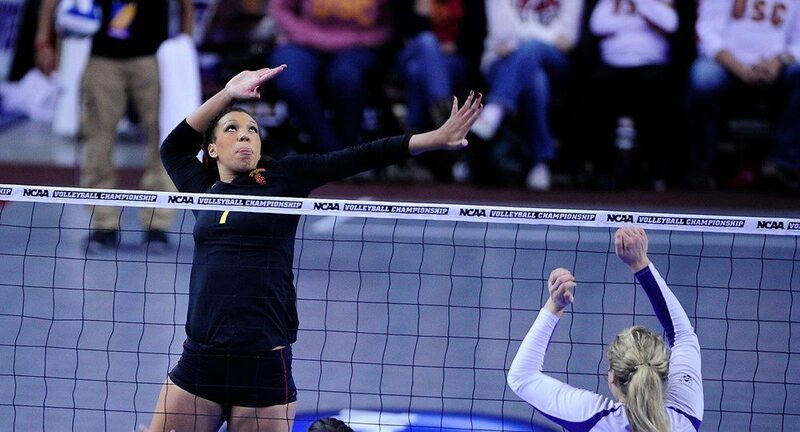 (...Continued from above) At USC, Nwanebu was named AVCA National Freshman of the Year in 2013 and Volleyball Magazine Freshman of the Year after averaging 3.47 kills per set and hitting .358. She was also named AVCA All-America First Team, AVCA Pacific South Region Freshman of the Year, AVCA Pacific South All-Region Team, Volleyball Magazine All-America Second Team and the NCAA Los Angeles Regional All-Tournament Team. In 2013, she led the Trojans to the NCAA Regional Final, posting 30 kills on a .566 hitting percentage and tallying 31.0 points in USC's loss to Washington. She later was chosen by USA Volleyball as one of 12 players to serve the U.S. Collegiate National Team in the summer of 2014. In her sophomore campaign, Nwanebu averaged 3.12 kills per set on a .226 hitting percentage. She helped lead the Trojans to the NCAA second round. Prior to college, Nwanebu played for Texas Advantage Volleyball Club in Fort Worth, Texas and was named Most Valuable Player of the 2013 USAV Junior National Championships after leading TAV 18s to the national title. She attended Lovejoy High School in Lucas, Texas and was named the Mizuno/Volleyball Magazine High School Player of the Year, named an Under Armour All-American and was chosen as the Under Armour Skills Competition Hardest Hitter. "Everyone involved in our program is thrilled that Ebony chose to be a Longhorn," Texas Head Coach Jerritt Elliott said. "She brings great values to our program and The University of Texas. She is one of the premier players in the country and has the ability to take over matches with her physicality and volleyball IQ. I know our terrific fan base will love seeing her compete with the talent on our team."